With winter wrapping its chilly arms around us, it’s not only us struggling to get up in the mornings but also our furry friends. Arthritis is a common and well known condition, and Dr Christa touched on this topic in her awesome article ‘The Aging Pet’ in last month’s newsletter. We will discuss arthritis in a little bit more detail here. Also known as degenerative joint disease, arthritis occurs when a joint is unstable causing the bones to move abnormally within the joint. This instability can be due to developmental/inherited bone conditions, previous injuries or a normal aging process. Over time this abnormal movement erodes the protective cartilage that lines the joints as well as decreasing the lubricating joint fluid, eventually causing bone to rub against bone. In the early stages, this abnormality leads to chronic inflammation which in turn leads to new bone being laid down in the joint in an attempt to repair itself. Unfortunately this remodelling of the joint is not for the better, as the new bony deposits restrict the movement of the affected joint. Seen more commonly in middle aged to senior pets (…and even cats, they are just better in hiding it! 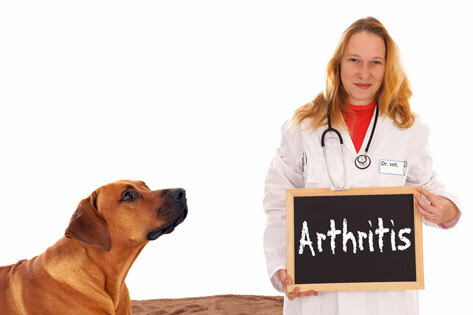 ), arthritis can also affect younger animals under the right circumstances. Developmental and inherited conditions like hip dysplasia (=joint laxity of hip joint; more commonly in large breed dogs like golden retrievers, Labradors and Rottweilers), elbow dysplasia (=most common source of pain in growing dogs with a forelimb lameness and arthritis of elbow joint), luxation of the patella (=most common bone disease of small dogs) and rupture of cruciate ligaments in the knee (=mostly due to skeletal disorders, affecting middle-aged large breed dogs) to name only a few, can lead to chronic arthritis and pain if left untreated. HOW DO I RECOGNIZE ARTHRITIS IN MY PET? Typically the first signs are stiffness when getting up after a long rest, such as first thing in the morning after a night’s sleep. You may see this when your pet stretches in a tentative manner and takes stiff, stilted steps. In the early stages, this stiffness ease within minutes as they get moving and the joints warm up. But with progression and more advanced cases, either the pain or physical changes in the joints mean the stiffness becomes more permanent. You may also notice that your pet is slowing down, takes longer to recover after playing, difficulty getting up or down stairs, onto or off the furniture or in and out of the car. They may also be reluctant to jump. Others signs include long-term lameness/limping on a particular leg. Some pets may lick constantly at a painful joint to ease the aching discomfort. Some may even be so painful that they are reluctant to be touched and may move away or even growl/snap or be irritable. As cats aren’t usually as active as dogs, their signs are usually subtle. Cats with arthritis may start to urinate or defecate outside the litterbox as it’s too painful to climb into the box. These kitty cats may also be reluctant to jump off high furniture like a table and rather jump onto the chair. They are also less likely to play and may show excessive grooming over a painful joint. HOW CAN WE HELP AND TREAT PETS WITH ARTHRITIS? It is important to determine if the cause of arthritis in your pet can be treated with corrective surgery. If not, there are a couple of management options to relieve and control pain. Always provide soft, padded bedding and keep in mind the height of doggy beds. Consider non-slip surfaces and ramps at stairs. Changes in temperature (cold weather), humidity and barometric pressure have been reported to influence pain perceived from arthritic joints in humans. By keeping pets in a weather-controlled environment may also minimize the impact of weather conditions. 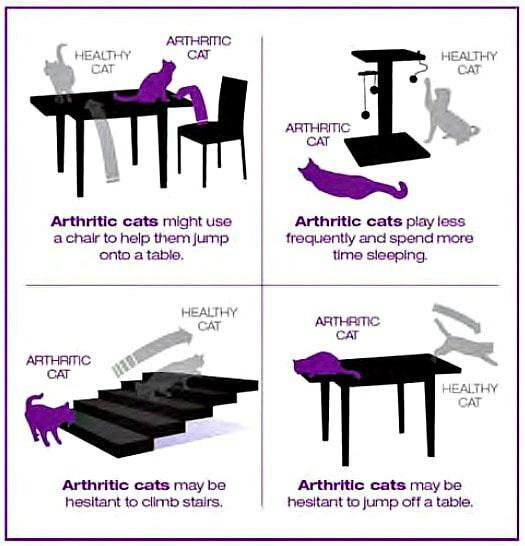 Although it may be difficult for our arthritic dogs and cats to move as easily as before, exercise is still an important part of your pet’s life. In a study comparing overweight Labradors to Labradors with ideal body condition, the leaner group lived 1.8 years longer. For both groups, however the lack of mobility late in life due to arthritis was the dominant cause of euthanasia. This study proved that arthritis progressed more slowly and was more easily controlled in lighter dogs. Gentle, controlled movement (like daily walks for 10min) keeps the joints smooth and helps to prevent stiffness and increase limb strength – but please avoid strenuous activities like jumping up, chasing, retrieving and playing with other dogs. Swimming is often a popular exercise alternative, as long as your dog is comfortable swimming. Special joint diets have multiple benefits – helping patients to lose weight and therefore decreasing the strain on painful joints, as well as containing joint supplements to decrease inflammation and pain. Supplementing ingredients like glucosamine, chondroitin and green-lipped mussel helps to nourish and protect the joint cartilage, which often helps the pet to experience less pain. These products typically takes 1-2 months before improvement is obvious and are safe on kidney and liver function. Omega 3 fatty acids also helps to decrease inflammation, swelling and pain in joints. The mainstay of treatment is anti-inflammatory drugs (NSAIDs like Rimadyl, Metacam, Previcox) which work on the peripheral inflammation (= in the joints). There are numerous products available in this class, some in chewable tablets others as liquid formulations. As in all forms of chronic pain, a syndrome called ‘peripheral sensitization and spinal cord wind-up’ occurs. This roughly means the body’s pain threshold has been changed and patients become more painful to minor painful stimuli. These patients then become partially or non-responsive to standard painkillers – a multimodal pain treatment plan by combining different classes of drugs, may then be indicated. Cold therapy/icing, heat therapy and massage may also have a pain relieving effect on joints. Icing provides direct pain relief by decreasing nerve conduction and decreasing swelling. This might be helpful after a period of exercise or before bedtime, but always make sure the patient is not uncomfortable. Heating may help to decrease stiffness and increase tissue extensibility. Range of motion and stretching exercises are extremely important to achieve improved motion of joints, as it helps to increase flexibility of joints and preventing stiffness. WHAT THERAPIES WILL BE BEST FOR MY ARTHRITIC PET? Each pet’s treatment plan is unique. Some patients will respond better to certain therapies and not to others. It’s therefor important to speak to your veterinarian and determine what therapies will be better suited for your pet. Please come and speak to us to help you to take to ‘ouch’ out of winter for our furry companions.